Super Mario Odyssey’s First Anniversary! Wow, can you believe it’s already been a year since Super Mario Odyssey brought perfection into our gaming lives? 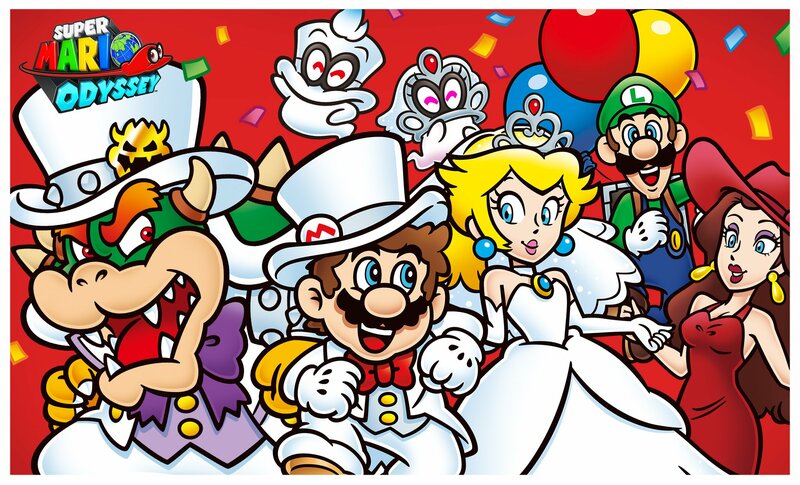 Yes indeed, Super Mario Odyssey celebrates its first anniversary today. Of the hundreds and hundreds of video games I’ve played over the course of my life, Super Mario Odyssey is easily among the very best. It stands as one of (currently) only nine games I’ve awarded a perfect 10/10, and probably its biggest competition for the title of best game of this decade is its own predecessor, Super Mario Galaxy 2 (another of my 10/10s). How good is Super Mario Odyssey? So good that, when I beat its story and the credits started rolling, I actually stood up and gave the game a standing ovation. You might say that doesn’t make any sense, since I just completed a video game by my lonesome and it’s not the same as a theater environment where other moviegoers could join in. But that’s just how good Odyssey is. Come to think of it, I don’t know why I didn’t mention my standing ovation in my review of the game somewhere. I don’t believe I’ve done that before with a video game, so it’s worth mentioning in regards to how much I enjoyed it. Why is Super Mario Odyssey so good? Like all the best games that don the Super Mario name, its a non-stop barrage of creative ideas. And Odyssey might just showcase this better than any other entry in the series. From the second the game begins to well after the credits roll, Odyssey presents players with insurmountable imagination. There’s not a moment in Odyssey that isn’t utterly delightful and inventive. Super Mario Odyssey is a game that takes elements from just about all of its predecessors, and rearranges them in such ways that it constantly feels fresh and new. Whereas most games – even exceptional ones – often present you with the long and the short of their vision within the first couple of hours and then repeat those elements for longevity, Odyssey never lets up with its restless imagination. It looks back on its peerless catalogue of predecessors not just to simply rekindle fond memories of gaming’s past, but more importantly, to reinvent the very things we love about the series. Happy one year anniversary, Super Mario Odyssey! One of the very best experiences gaming has to offer. Keep putting smiles on faces. Full Super Mario Odyssey review can be found here. I love Super Mario Odyssey so much! This tribute is great! Thanks! It really is such a special game. Previous Previous post: I Say! An Update!